Saying parsing, usually mean finding, extracting certain information, analysis data. Web site parsing can be used to create an online service, as well for penetration testing. For web sites pentester, the skill of parsing sites is basic, i.e. a security auditor (hacker) should be able to do this. The ability to extract information properly depends on mastery of grep command usage skills. In this article, we will consider the problematic moments of getting the source data, because all sites are different and unusual situations can wait for you, which at the first glance can lead to a dead end. Similarly, you can automate the getting and extracting of any information from any web site. One of the features of web site parsing is that, as a rule, we work with the source code of the page, i.e. HTML code, not the text that is shown to web site visitors. Therefore when creating a regular expression for grep, you need to build on the source code, not the rendering results. Although there are tools for working with the text resulting from the rendering of the web page - this will also be described below. In this section, the main focus is on parsing from the Linux command line, since this is the most common (and habitual) work environment for a web application penetration tester. Examples of using different tools from the Linux console will be shown. Nevertheless, the described here techniques can be used on other operating systems (for example, cURL is available in Windows), and also as a library for use in different programming languages. HOST can be a website address (URL) or an IP address. In fact, curl supports many different protocols - but here we are talking about web sites. It is good practice to enclose URLs (web site and page addressed) in single or double quotes, since these addresses can contain special characters that have particular meaning for Bash. Such symbols include the ampersand (&), hash (#), and others. HTMLCode is the name of the variable (note that when you assign (even second time) the variable name is written without the dollar sign ($), and when you use the variable, the dollar sign is always written. ="$(COMMAND)" is the construction of a COMMAND without outputting the result to the console; the result of the command is assigned to a variable. Note that neither before nor after the character equals (=) there are no spaces - this is important, otherwise there will be an error. Real examples are given below. You can instruct cURL to follow the redirects, i.e. open the next page. The remote server sees which program is trying to connect to it: it is a web browser, or a web crawler, or something else. By default, cURL passes something like "curl/7.58.0" as User-Agent. Therefore, a server sees that it is not a web browser that connects, but a console utility. The essence of the message is that the curl command will output binary data that can lead to a mess in your terminal. We are offered to use the option "--output -" (note the hyphen after the word output - it means standard output, i.e., displaying binary data in the terminal), or save the output to a file like this: "--output <FILE>". As a result, the usual HTML code of the requested page will be displayed. Currently, most sites use the encoding UTF-8, with which cURL works fine. This line means that windows-1251 encoding is used. After that, instead of unknown symbols you will see national letters. Referrer is information about the page with which the user came to this page, i.e. this is the page on which there is a link that the user clicked on to access the current page. Sometimes websites do not show information if the user does not contain the correct referrer information (or they show different information, depending on the type of referrer (search engine, another page of the same site, another site)). You can manipulate the referrer value using the -e option. After that, in quotes, specify the desired value. The real example will be a little lower. Sometimes websites require a username and password to view their content. With the -u option, you can transfer this credential from cURL to the web server as shown below. By default, curl uses basic authentication. We can specify other authentication methods using --ntlm | --digest. Authentication in web forms is the case when we enter login and password into the form on a website. This authentication is used at the entrance to the mail, forums, etc. 1) Use Burp Suite or Wireshark to find out how the data transfer occurs. You need to know: the address of the page to which the data transfer occurs, the transmission method (GET or POST), the transmitted string. 2) When the information is collected, curl is started twice - for the first time for authentication and cookies dumping, the second time - using the received cookies, a page is accessed, which contains the necessary information. This scheme may not work in some cases, since the web application may require already set cookies when using the first command (there is such behavior on some routers), it may also be necessary to specify the correct referrer, or other data for authentication to be successful. Sometimes you need to extract information from the header, or just find out where the redirection is going. Headers are some technical information exchanged between a client (web browser or curl program) with a web application (web server). Usually we do not see this information, it includes such data as cookies, redirects, User Agent, encoding, compression, information about the handshake when using HTTPS, HTTP version, etc. In my practice there is a real example of the need to parse headers. I needed to extract file version number from HTTP response header of Acrylic Wi-Fi Home. The version number is contained in the downloaded file, which has the name like Acrylic_WiFi_Home_v3.3.6569.32648-Setup.exe. In this case, the file name is also absent in the source HTML code, because when you click on the "Download" button, an automatic redirect happens to a third-party site. When preparing a parser for, I ran into the situation that I need to get the file name, and preferably not downloading it. In this command, we already knew the -s (suppress output) and -A options (to specify your custom agent) options. The new option is -I, which means showing only headers. Therefore, the HTML code will not be displayed, because we do not need it. The essence of the error is that you can select only one method of the HTTP request, and two are used at once: POST and HEAD. By the way, the -d option (its alias was mentioned above (--data), when we talked about HTML authentication via forms on websites), transmits data using the POST method, i.e. as if ones clicked on the "Send" button on the web page. The string with Location will never be found, although it is clearly on the screen. The 2>&1 construct redirects the standard error output to standard output, as a result, nothing changes externally, but now grep can handle these strings. You can get web pages as an image, or just text that is displayed to visitors. The console will display the contents of the web page in text form, which is shown to users who opened the page in a normal web browser. It will output something like 15063.877. RSS, XML, JSON, etc. are text files in which the data is structured in a certain way. To parse these files, you can, of course, use the Bash tools, but you can greatly simplify your task if you use PHP. 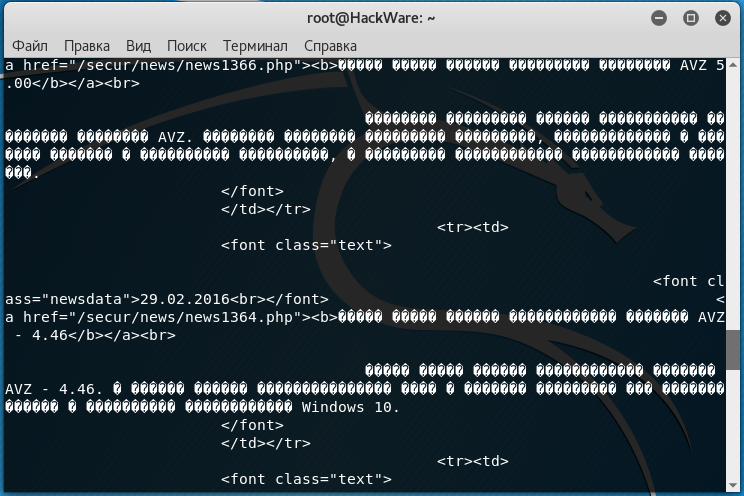 php parseXML.php "`curl -s https://hackware.ru/?feed=rss2`"
In this example, to get the file from the web server, use the curl -s https://hackware.ru/?feed=rss2 command, the resulting text file (string) is passed as an argument to the PHP script that processes this data. The same file parseXML2.php can be placed in the directory of a web server and opened in your web browser. Here you can see the situations that you may encounter when parsing websites. The studied material will help to better understand what is happening at the moment when you connect to the website. Because a pentester often uses non-web browsers clients to work with websites: various scanners and tools. Knowledge about referrer, User Agent, cookies, headers, encodings, authentication will help to sort out the problem faster if it arises. For frequently occurring tasks (collecting email addresses, links), there are already quite a lot of tools - and often you can take a ready solution, and not reinvent the wheel. However, with the help of curl and other command-line utilities you will be able to obtain the data from any site as flexible as possible.